Christian Bales is this year's valedictorian at Holy Cross High School in Covington, but during Friday night's graduation ceremony, he was forbidden from delivering his speech. So, too, was the student council president. 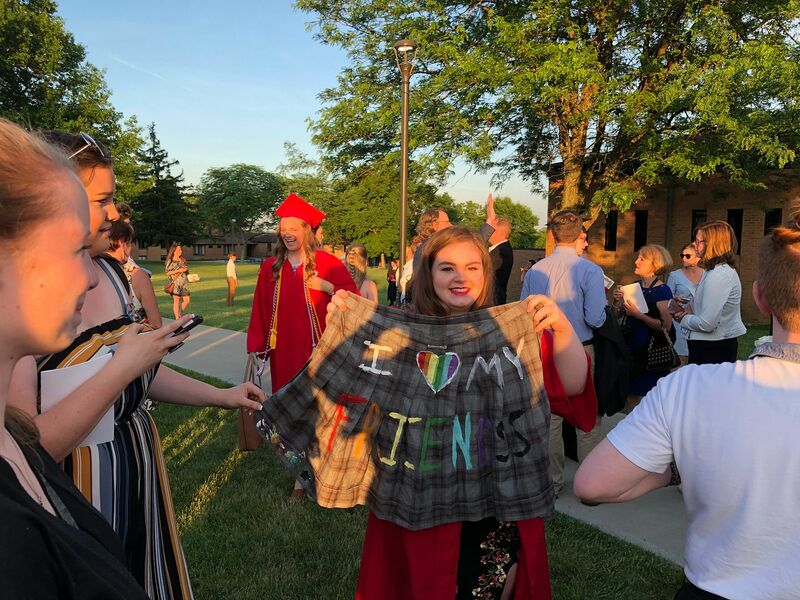 Instead, Bales and the other student delivered the remarks to which the Diocese of Covington objected outside the Connor Convocation Center at Thomas More College in Crestview Hills after the ceremony. Bales learned that his speech was rejected on Friday morning. His mother had already been specifically spoken to about what attire was appropriate for the ceremony. "I had a conversation with the school just basically wanting to talk about the dress code and what was expected - tie, shirt," said Gillian Marksberry, Bales's mother. "Christian has been known to wear his fabulous eyebrows and eye lashes and so forth. It was hard to listen because it's always difficult when someone is not accepting your child, somebody who is honestly such a wonderful, beautiful person, but I am old enough and wise enough to know that we have to perform sometimes. That's how we navigate through society, and he had worked so hard on this title, I didn't want it taken from him. "So, I acknowledged that we would respect (the dress code) and had a talk with Christian and he understood. So, we moved forward this week fully expecting to come tonight and deliver the speech and cheer him on, and that would be a wonderful closing to his high school career." In a statement to The River City News, the Diocese of Covington said the speech was turned in late and included parts that were political and against the Catholic faith. But Bales said that he did not understand exactly what was meant by that. "There wasn't very much talk about a definite deadline for the speeches. We didn't hear much about it," Bales said. "I turned mine in unfinished. I had a draft last Friday and turned in my finished speech on Tuesday." He said Holy Cross officials were fine with it - but later found out that the Diocese objected. A large crowd of classmates and other supporters gathered around Bales as he delivered his remarks outside at Thomas More following the ceremony, which was not attended by Bishop Roger Foys, who had been listed in the program. Bales said that his speech was mostly about the power of youth in America. "I thought it was pretty mild. Maybe part of it was, I referenced the Stoneman Douglas teenagers. I know they have been strong advocates for gun reform, but I didn't talk about gun reform, so I really have no idea," Bales said, referencing the student activists that emerged following the deadly shooting at Marjorie Stoneman Douglas High School in Parkland, Fla. He also said that he was not sure whether his speech was rejected because he is gay. 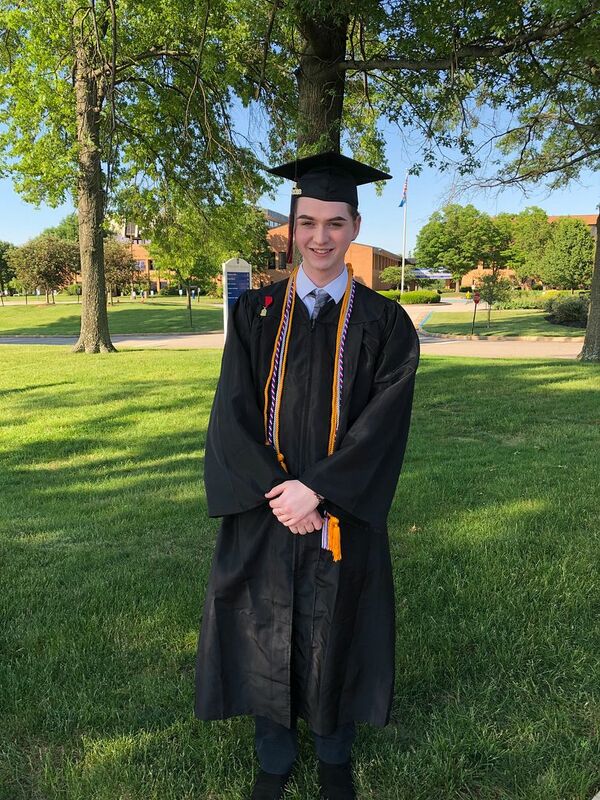 Supporters wore rainbow ribbons as they accompanied him to talk to members of the media after he delivered his speech (security officers forbade journalists from being on Thomas More's campus during the graduation ceremony, so an interview was conducted across the street from campus.). Bales suggested that he had been a polarizing figure for school and Diocese leadership because of his activism. He specifically cited his involvement in a youth organization that helped craft a bill to have a statue of Confederate president Jefferson Davis, a Kentucky native, removed from the state capitol. He also said that his class has been particularly outspoken. "I think that might have been a factor that put us on their map and push us to their approval," Bales said of the Diocese. His classmates, however, have been largely supportive. "I don't think I've spoken to one person who has opposed me. The only people who have opposed me have been the Diocese and the people who had to pass on their words to us," Bales said. "There are so many of my classmates who wanted to come outside and watch our speeches." "I think that gets to what my speech was about in the first place," Bales said. "It is about empowerment through youth. We, as youth, have such dynamic ideas. ... As long as we don't let go of those values, we are going to be able to obtain change." Marksberry said that Holy Cross has been good to her son. "Thank you to Holy Cross. Thank you for embracing him, for helping him discover his voice, for helping him to love himself, helping guide him on his journey of growth, because individual teachers and staff at Holy Cross are absolutely amazing. I want people to understand that," Marksberry said. "I just always felt so blessed that they were part of our lives. She had a different message for the Diocese. "To the Diocese, I am disappointed. I am disappointed as a parishioner. I expected more, especially when we are raising our children and supposed to, as Christians, teach tolerance and unconditional love. I'm just disappointed." Bales, who will major in biology at the University of Louisville, was unsure which part of his speech was in conflict with the teachings of the Catholic Church. "What I've been taught about the Catholic faith is, it's about love and tolerance and acceptance of all people," he said. "I think that in my experience with the Diocese of Covington, it's kind of been antithetical of that. I've only had experience with them through our school but I have faced a lot of opposition based on who I am as a person, I don't violently oppose them ever, it's just kind of me being myself that is faced with opposition. "I think that that might kind of scare them. I know a lot of people who are set in their ways are afraid of change, but it's coming and I am the prime example of that." The young people will win is a mantra that I'm sure many of you have heard if you've been attentive to the media recently. It's a phrase adopted by the prolific Stoneman Douglas teenagers who are advocating for an agenda - our rights to feel secure as humans. We frequently see these individuals behind a computer screen, and therefore we see them as a separate body from us. However, they possess the same capabilities as us graduates. As we enter into the real world, we must remember that we have a voice. Throughout the past four years at Holy Cross, I've learned how to utilize my voice to advocate for my beliefs as an ethical individual. I've faced opposition in a number of scenarios, but my voice continued to grow in intensity as I faced more adversity. Rather than allowing opposition to silence us, we must utilize it as empowerment. As long as we nurture our minds as youth, we'll be able to be equally impactful as we encounter the world. The young people will win is a mantra that's progressive by nature, but it suggests there's one winner and one loser, two sides pitted against each other in a primitive battle of right and wrong. The inherent flaw in this mantra is that it erases the truth that we're all attempting to perpetuate God's will by bettering the quality of life for those around us. Mr. Eifert has taught me that we're all battling for the same ideal - the ideal of happiness. He's a man who embodied the spirit of the Holy Cross community precisely, someone who was rooted in faith, who always aided others, and who used his booming voice for the good of all people. We must use our voices to do the same. Only then can we say we're winning. Rather than gauging victory by what we accomplish on paper, we must gauge victory by the amount of hearts we can cleanse. Many of us have accomplished this at Holy Cross, but we must not lose the same drive once we graduate. We must keep faith as we continue to grow, and we must continue to win as we encounter more and more people. The young people will win because we're finished being complacent. There's a misguided notion that wisdom is directly proportional to age, but we're disproving that daily. Sometimes the wisest are the youngest in our lives, the ones who haven't yet been desensitized to the atrocities of our world. Therefore, we young people must be the educators. The young people must be willing to speak candidly about issues, and we mustn't tremble in the face of the institutions that try to silence us. We've already accomplished this in our own community. We've been living examples of this mantra whether you all realize it or not. Just within the last year, many of us have worked tirelessly to defend our ethics. Morgan, you were the strongest voice when the Parkland tragedy happened, and you personally wrote an address to honor those lives lost. Izzy, Juliana, Katherine and I fought to defend our history and relocate the Jefferson Davis memorial in the Kentucky State Capitol building. Many of you went on the March for Life to protect the lives of the unborn, and the list goes on. The most important thing to remember is that youth is not proportional to age, nor is it physical, rather it's a mindset that we must carry with us into the world.The only way we can stop being impactful is if we let go of our youth and stop advocating for our core values. In my experience at Holy Cross I've learned that the best way to attain change is to be a visible example in our world, and we must plan to continue to utilize our voices in order to better the lives of all those we encounter. Class of 2018, we are dynamic. We are intelligent. We have a voice, and we're capable of using it in all communities. We've learned a multitude of things at Holy Cross, and for that we extend a sincere thanks to our teachers, parents, faculty, and peers. However, it doesn't stop here. We must take what we've learned in this community and apply it to the world we are about to encounter. We are the young people, and we will continue to win.